FAH - Future RX. Vinyl LP. Bleep. Back in 2014 Alek Stark's Fundamental Records released two double albums by an artist going under the guise of Patronen. 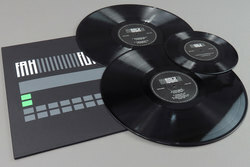 In true techno style, little information was given about who was behind the recordings, with Fundamental true to the craft preferring to let the music speak for itself. Fast forward four years and many hushed conversations of who could be behind this shadowy and essential electro project within various corners of the internet, and Patronen has been unveiled as the project of one FAH. A producer famed for releasing one of the very best CPU's and always present in the Fundamental 808 Boxes, now returning to the fold with the astral projection noir of his new dimension changing Future RX. Debuting as the inaugural release on Mental Fun Records, a new label set up to run in tandem with Alek's Fundamental Records. Future RX was made with just one machine, the classic Yamaha RX5, but with special modifications that allow him to use the machine’s sound converters and sequencer with his own sounds, adding warmth and an incredible texture that you can hear in every track Fah created for this album. 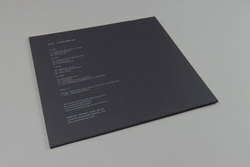 Across both professionally mastered 12"s and the bonus 7", FAH paints a very vivid sky wide view of electro, one that focuses in on the limitations of his trusted RX5 module, Much like the truly best minimalism, where the artist is forced to focus in on the key, core element of a sound and nothing else. FAH's strengths lie in just this. Future RX as a captivating concept and vision of the future of electro dials into the minimalist approach by crafting tracks that with a stripped back set up, are both sure to go off in the right DJs hands yet also are perfectly suited to evenings spent star gazing from the comfort of your living room. The systemwide spectrum of this one tool to build the blocks of tomorrow sees FAH cutting out his own, unique path within the very singular sound and gives the recordings a true vitality that makes them feel truly real, it's like you can reach out and step inside this world for optimal escapism. Something that only the truly very best science fiction themed books, films and music can really offer or achieve. Artwork and quality of the sleeve is what Fundamental Records have accustomed us, high quality italian cardboard made of 100% recycled waste, silkscreen printed by hand in three colors. 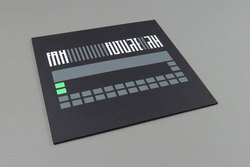 FAH's Future RX follows on from some of the most essential electro projects of recent years to be released by pioneers of the hypnotic groove including: DMX Krew, Luke Eargoggle, Boris Divider, Cygnus, Faceless Mind, Das Muster, label head Alek Stark and Microlith aka Rhys Celeste.